6 tips to help your baby sleep well in the heat. I thought I’d share my best tips to help your baby sleep well in the heat. While we try and make the most of the sunshine, I often struggle in the heat. So I really feel for little ones in the warmer weather. Here are some tips to try and make night times more comfortable for your little ones, when it’s just too hot! These can also be useful for when you’re travelling. 1. Keep your child’s room dark during the day. To help your baby sleep well in the heat, try and keep curtains or blinds drawn during the day to stop rooms heating up during the course of the day. You can also open the windows open to keep the air circulating which will mean the room is less stuffy and will be cooler at bedtime. 2. Use an electric fan. “The most sensible option is to use a fan,” recommends Mary Morrell, professor of sleep and respiratory physiology at Imperial College London. “It will help move the air around your body and increase the chance of sweat evaporating.” Many parents worry that a fan will keep their baby or child awake. But children will adjust fairly quickly and won’t be disturbed. Try not to point it directly at your child. This may disturb them and cause them to wake in the night or early in the morning. 3. Give them a cool bath. The Children’s Sleep Charity advises running a cool bath for your baby before bed. This will help bring their temperature down. 4. Use a nursery thermometer. The NHS advises that your baby will sleep most comfortably with the room temperature between 16 and 20 degrees. So remember to check the temperature of the cot regularly before your little one goes to sleep. 5. Reduce the amount of clothing your baby wears. In hot weather, you can put your baby or toddler down in just their nappy. Use a well-secured thin cotton sheet that won’t work loose and cover your baby’s face or get entangled during the night. A low tog cotton sleeping bag for younger babies can also work, rather than nylon bedding. They will absorb sweat rather than leave the sleeper covered in a film of moisture. 6. Keep your child well hydrated. Like adults, babies and young children need to drink plenty of fluids to avoid becoming dehydrated. The NHS advises that if you’re breastfeeding your baby, you don’t need to give them water as well as breast milk. However, they may want to breastfeed more than usual. If you’re bottle feeding, as well as their usual milk feeds, you can give your baby cooled boiled water throughout the day. If your baby wakes at night, they’ll probably want milk but if they’ve had their usual milk feeds, try cooled boiled water as well. 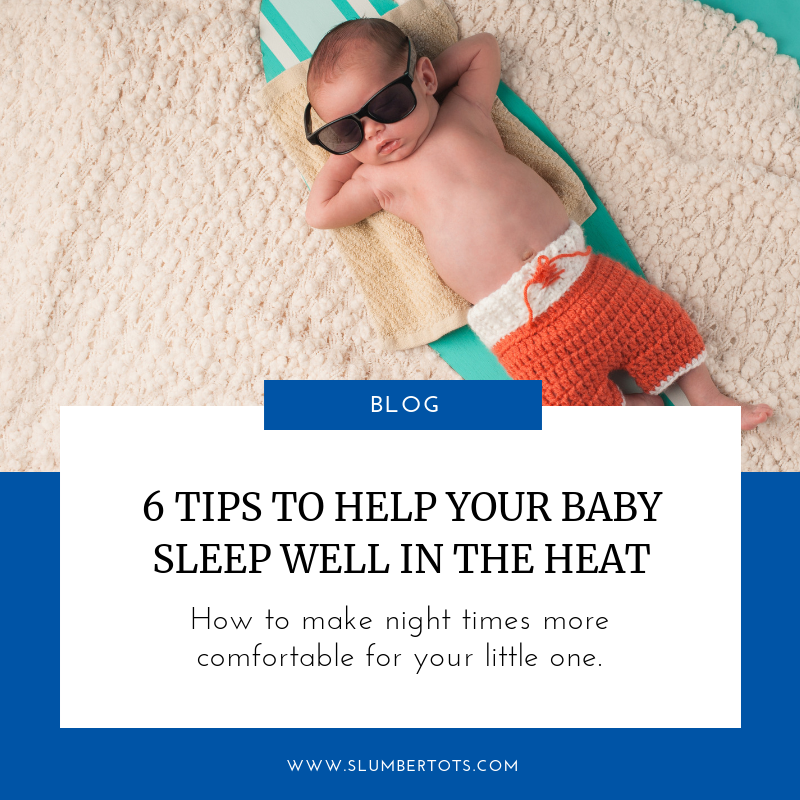 So those are my best tips to help your baby sleep well in the heat. But if you need any help getting things on track, then I’m always here to support you. If you need a few more tips to help with your little one’s sleep, download my free bedtime guide: 5 steps to a better night’s sleep.